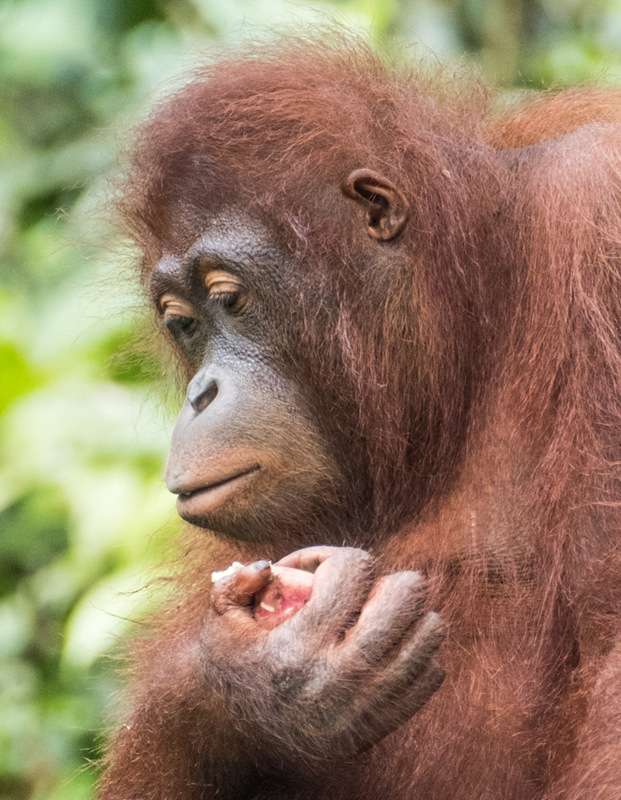 It’s incredible to see just how intelligent and human-like Orang Utans are. I thought I’d start writing snippets as I will forget the amazing moments where we just look at each other and go ‘wow’, or ‘they’re just like us’…..
Our first week is in the nursery area, with the OUs who are between 3 and 4 years old. Sometimes they have massive tantrums just like toddlers, and when they don’t like a situation they scream and fling themselves to the floor, beating it with their hands. Other times they are desperate to be cuddled, which we are not allowed to do. As we are working towards releasing them to the wild, they need to become less reliant on humans. It’s very hard to resist though when they stretch their arms and hands out to you, and look at you with big brown eyes. The photo on the left is of Awantang, a wild baby. When we transfer them to the outdoor play enclosure or onto the climbing ropes some of them immediately wrap themselves around our legs rather than walking nicely holding our hands. I’ve often walked for a couple of minutes with an OU sitting on each foot and clinging on to my legs. It doesn’t make walking very easy! 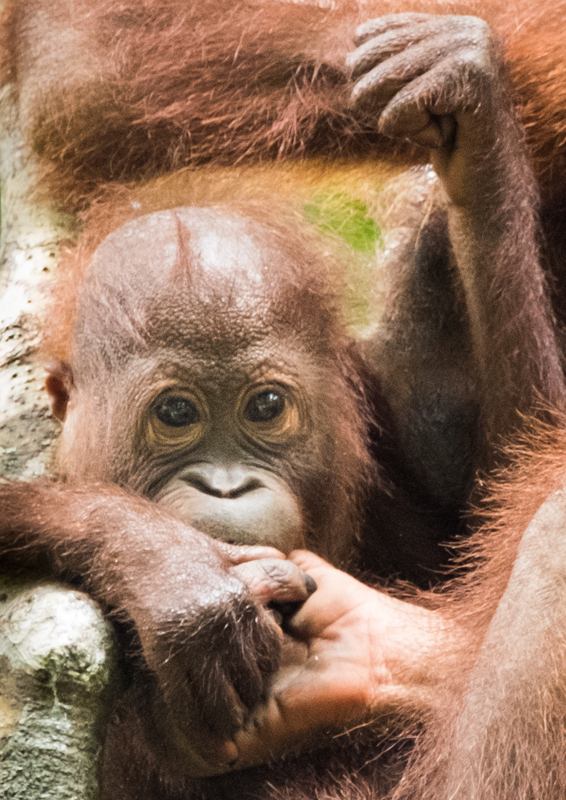 We have one OU called Sepilok, who will move up to the older group in a couple of month’s time. He’s very naughty and strong willed, and sets a bad example to all the others. Even though they are all very young, their strength is incredible, and once they grab us, it sometimes takes intervention from somebody else to peel them off. When we take them to their climbing ropes and trees it’s our job to try to keep them above ground so that they become more skilled at climbing, and also because the forest floor has ants, mites, and bacteria which upsets their stomachs. If Sepilok decides to test us, he swings on the ropes or on branches, waits until we are watching him, then just lets go so that he drops to the ground like a stone. As one of us rushes towards him, he will occasionally scoot up another tree, run towards us and cling on to our legs, or lie in a heap waiting for us to grab an arm to lift him up again. Once he has started doing this, several of the others copy, and we rush from one to the other picking them up and shoving them up a tree. Koko copied him once and immediately buried her face and crossed her arms too, so that we couldn’t get at an arm to grab! In the area near where we prepare the food and milk, and where the overnight enclosure are, the released OUs will often come and hang around waiting for an opportunity to be naughty. Each day we work in three rooms – the kitchen where we prepare the milk, the second kitchen where we prepare the food, and the room with the overnight enclosures. There is a pregnant female called Cinta who likes to lie on a steel table outside, and she watches us as we work. The positions she lies in are just like us when we relax or go to sleep. We’re not allowed to take ‘behind the scenes’ photos at all, so here are a some stock photos of humans as examples of the poses I’ve seen her in. 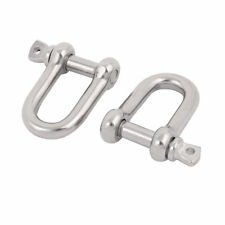 All the enclosures for the OUs are bolted shut using one of these U locks, and then tightened with a special key, otherwise the OUs would be able to unscrew them! Every time we leave a room unattended for more than a couple of minutes we also have to secure it with one of these locks. If we leave the kitchen but will be back within a minute or so, we flip over a latch on the inside, which is very fiddly to get at through the metal grid door. This morning we had just fed the young OUs with their solid food, and went back to get the milk that we’d made up for them. They still drink from bottles with teats on, but there are two older ones that just have a stainless steel bottle with an open top. I questioned where the second bottle was as there was only one, and we shortly realised that Cinta had waited for us to leave the kitchen, flipped the fiddly latch, nipped inside, stole the bottle of milk, and was sitting on the roof calmly drinking it! 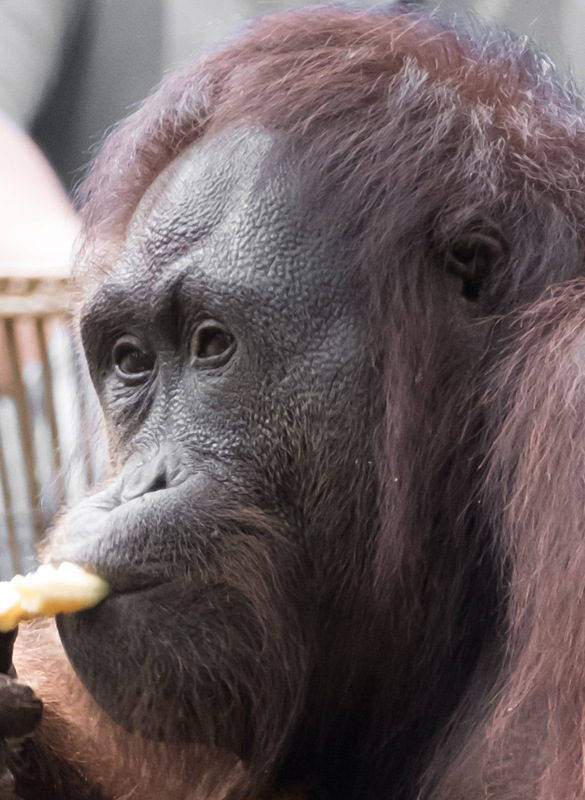 The ‘toddlers’ will often be joined by one or more released OUs when out playing – sometimes they play nicely, and other times they are frightened by the older ones. One thing that most of them have in common is that they don’t like rain. During one downpour we saw one of them swinging along the ropes with quite a few small leafy branches on its head and shoulders. As the humidity is so high here, never before have I been happier to be outside in a downpour, although it only offered a little relief from dripping with sweat. Each time we are near to the OUs or cleaning their enclosures we have to wear a face mask and gloves. 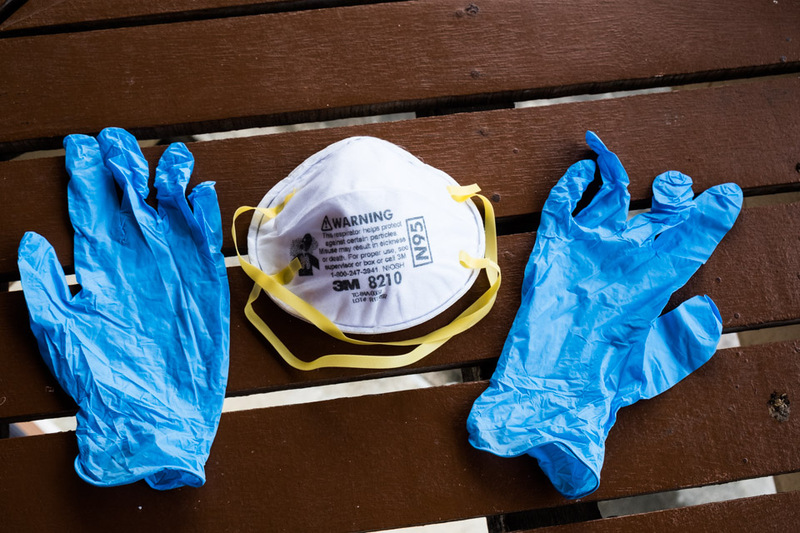 The most revolting part of working here is not picking up poo from enclosures, hosing down diarrhoea, or having an OU cling to your legs when it’s just pooed – it’s wearing a face mask that’s soaking wet and full of water that’s your own sweat 😦 In addition to that, after each session when we peel off our gloves our skin is all wrinkly as if we’ve been under water for hours. One afternoon we’d forgotten to shut the door when preparing the afternoon food, and Kalabatu walked in. There were just two of us in there, and neither of us were going to challenge him, so he walked up to the fridge, looked at us, opened the door, stole some vegetables, and scarpered with them! Finally, they are so funny to watch when they do a series of ‘head over heels’ just for fun. The photo below is of one of the released OUs.